John Barber is the current editor of the Hasbro-licensed titles at IDW and is well-loved by Transformers fans for his Herculean effort of integrating the Transformers movie titles, the prequels, and the sequels into one seamless story. If you've ever read or heard an interview with him, you know Barber is a man who both knows and loves the franchises under his care. In this issue, Barber bridges the gap between the first and second movie. General Hawk and a very Rachel Nichols-esque Scarlet man The Pit in Egypt while the emphasis on Roadblock and Snake Eyes makes it clear who will be carrying the torch in the second movie. The use of Flash (Barber's first G.I. Joe as a kid) and Charbroil in their Rise of Cobra-release deco was a suprising and fun nod to those of us who collect the figures. The story itself is intriguing. Barber isn't just releasing a book to showcase the new stars of the movie. There's actually a plot with a bit of mystery. While running humanitarian aid during a foreign civil war, Red Ninjas attack the Joe's helicopter, killing or wounding a dozen Joes in the process. Their singular mission seems to be the abduction of Mainframe. The "why" of that is something we'll just have to wait on. Roadblock is undoubted the star of this series, and it doesn't take Barber long to introduce him to us. From his conversation with Mainframe, we know that Roadblock is an experienced soldier, a team player, a chef, and someone who respects the cerebral abilities of his colleague. During the firefight, we see him as cool-under-fire, determined, and most importantly, loyal. Roadblock's reaction to leaving one of him men behind is the defining theme of this issue. We see little of Storm Shadow in this issue, but it's clear that the Red Ninjas are under his command. This issue is set in the past (indeed, it is set before Rise of Cobra), and we may infer from his conversation with Zartan that Storm Shadow is being recruited into the fledgling Cobra organization with this mission. 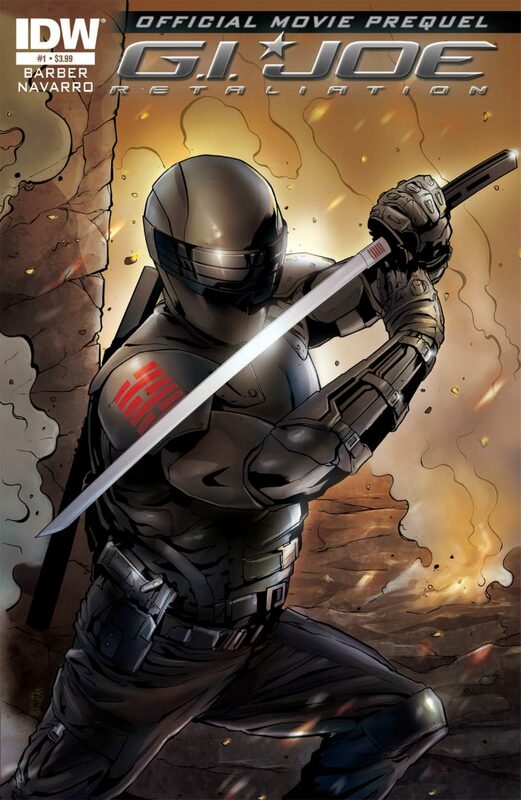 We will undoubtedly be seeing more of Storm Shadow and his army in upcoming issues. Hawk's mysterious phone call at the end of the issue makes one wonder: is this the first "appearance" of Joe Colton? The art for IDW's Joe titles have invariably been strong for a while now, and the work by Salvador Navarro is no exception. He does stumble a bit with the dynamic art: some of the action sequences were difficult to follow. But otherwise his style complements Barber's storytelling pretty well. The color palette is muted, as most of the action takes place at night or in The Pit. But that just serves to underscore that this is a storyline that deals with dark issues. I do question the decision to color Roadblock's goatee gray. From the movie trailers, we see Johnson's goatee is black. Does Roadblock hit the "Just for Men" between this issue and the movie? In general, I am usually not impressed with comic books adaptations and tie-ins to movies, and I was pretty disappointed with the books that were released with Rise of Cobra. This surprised me, however, and I'm really looking forward to the next issue. Highly Recommended.